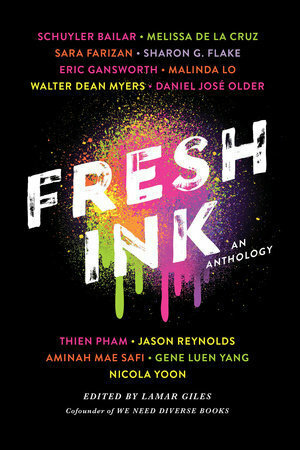 SYNOPSIS: Careful–you are holding fresh ink. And not hot-off-the-press, still-drying-in-your-hands ink. Instead, you are holding twelve stories with endings that are still being written–whose next chapters are up to you. More often than not, if I ran across a character who shared my race and gender in a book he was a gross stereotype, comic relief, token sidekick, or, depending on the genre (I’m looking at you, science fiction, fantasy, and horror), there to die so the real hero could fight another day. I love anthologies, and I love getting the opportunity to promote authors of color and diverse books, so as soon as I learned that the co-founder of the We Need Diverse Books movement was editing this anthology, I had to grab it—and I am so happy that I did. Before I get into the full breakdown, I’d like to give shout-outs to a few of my favorites from the collection, which were Why I Learned to Cook by Sara Farizan, which gave me all of the happy cutesy feels; One Voice by Melissa de la Cruz, which broke my heart in the best way; and Super Human by Nicola Yoon, which reminded me that even bullet-proof superheroes are capable of having their hearts broken by this world. What an absolutely precious beginning to the anthology: a teen couple swapping eraser tattoos and memories before one of them is uprooted to another state with her family. Not only is this story hilarious, sweet, and a little bit of a tearjerker, but it also takes a moment to show the microaggressions black individuals face in even quiet moments, like the general disregard and rudeness the characters are treated with by the white couple moving into Shay’s former home. I already knew I’d love anything Jason wrote for this collection, but this was honestly the most wonderful beginning to the book. That was the problem with being queer. You should never assume, but if you didn’t assume, you had to ask. And asking directly was so hard to do. After how cute and sweet the first two stories were, this one took me by surprise with how heavy and sad it was: a narrative of a seventh-grade Native boy in a school full of white kids in the 70s, where he has to deal not only with microaggressions and outright racism, but also the fact that of the few other Native kids in his school, many of them are light-skinned and “passing” enough to shun him, too. He stands up for himself and it is such an empowering story, but it also hit me really hard on a personal note. My grandmother (rest her soul) was half-Native, and not white passing. I remember stories she told me about feeling excluded because of her skin color or her features, and how disconnected and erased she felt from her culture in a country that has tried so hard to forget Native people. It absolutely breaks my heart that Native people have been cast aside so much, and for so long, but stories like this—and like hers—truly need to be told. Biohazard: may cause heart to burst. This is a unique piece of the collection, as it’s actually a play, and man, did this one hit me hard. It’s a story of a few dead young black men, tagging walls in the afterlife as they discuss their memorials, how they died, and how they keep their own memories alive with their tags. There’s a devastating twist at the end, and a lot of subtle commentary on the way a corrupted and damaged “justice” system terrifies and warps the psyches of marginalized individuals, particularly black men. When I finished reading the story and realized where I knew the name from, and remembered that this author actually passed away a few years ago, it added some sort of extra heartbreak to think that even in his seventies, Walter was still having to write about the same injustices and cruelty he’d witnessed his entire life. He let another silent prayer rise inside him, the one said to call on one’s warrior spirits before battle, and we gathered in the thick air around him. Sadly, this is the first story I haven’t enjoyed in this collection, and I genuinely did not like it at all. It’s a sci-fi short, but it doesn’t feel like a short story; instead, it felt like I was just reading a passage taken out of context from a larger novel. There’s no explanation to any of the action going on, you’re just dumped right into the center of it, and I had no chance of connecting with the plot or characters in any way. There’s war, rival groups, guardian spirits, and suddenly, aliens? It didn’t work for me. What’s a boy’s duty to himself? Unfortunately, this historical fiction story made two in a row that I just couldn’t quite connect to; while the last one was “too much”, this one was just a mixture of boring and plotless. A young man sits in a café, observing the people around him and thinking about his father’s farm, the thieving boys he’s friends with, and his dreams of joining the Navy and becoming a sailor during WWII. There’s just not much of anything going on, the characters are mostly wholly unlikable, and I wasn’t a fan, sadly. I wanted America to want me because I was already a part of the fabric of the country. My god, you guys… this story is heavy and relevant and so, so good. The narrator is a Stanford student whose family moved to California from the Philippines when she was a child, and she lives in constant fear of deportation. She talks about how she didn’t know her documentation wasn’t proper until she applied for college, and she had to jump through hoops to be allowed to stay, including forfeiting her rights to a scholarship she had worked hard to earn. The plot of the story follows her throughout a few days at her college in which racial slurs are spray painted on buildings and vehicles, and she laments the fact that her white-passing boyfriend isn’t able to understand why she feels so unsafe at their school. It’s just a tremendously sad and realistic depiction of something that so many people in the US are going through right now, and if there is one story in this collection so far that I find to be the most relevant to 2018’s sociopolitical climate, it’s this one. This little story is told through a comic strip, which is a neat addition to the anthology and a fun break from the standard text formatting. It’s about a Japanese-American teen who faces erasure from his group of friends while playing Swords and Spells (essentially D&D). While it’s a cute short, I wish more had taken place to address what legitimately jerks his friends were being, instead of it being swept under the rug at the end. Beneath the surface, I am not the girl everyone says I’m supposed to be—in fact, I’m not even sure I’m a person. I’m just swimming. I am a singular action, proof that I am alive and powerful. Always the wrong place. Always the wrong time. A country that did not value his life. Okay, this story… I knew Nicola’s story would be good. I don’t think her novels are perfect, but she has a way of writing that is always capable of hitting me hard, and I expected this to be no exception, but I didn’t think it would break my heart so much. It tells the story of a seventeen-year-old black girl who is sent to attempt to reason with X, nicknamed the “Black Superman”, who has decided to forsake his humanity-saving tactics in favor of wiping out the population instead. When she learns what changed his mind, it’s absolutely shattering. I’m choking up just writing this review, thinking about the society that I live in and how utterly and completely broken this system is. I don’t want to spoil the surprise, only because this is a story that you need to soak in, to allow it to hit you in the chest the way it did for me, but I will say that it was the perfect ending to this anthology, and I will carry it with me. All quotes come from an advance copy and may not match the final release. Thank you so much to Crown Books for Young Readers for providing me with this ARC in exchange for an honest review! This book seems a really great diverse read! Yes!! We need these Mazing diverse reads!!! Isn’t it gorgeous? I think I’m going to have to pick up a finished copy when it releases. Awwww, yesss! ♥♥ I hope you get the chance to check it out, Taasia! I still have this as an eARC that I need to read but I have a couple of arcs to read first. Awesome review! I hope you enjoy it when you get to it! ☺ Thank you! !